A Triathlete's Journey to Ironman & Beyond: Family grows again! So, after the recent additions to the family early in the week, my sister was next due. The original date was 21/03/12. Due to a few family reasons, which I am so happy about, the baby decided to arrive early. So in the space of 1 week, both my brother and sister have babies. Throw in my Best mate and their addition, things have been hectic. Training has been going well still and the body is coming good. This might chance this weekend as flying to Perth for a wedding is going to be great.... But maybe not beneficial. The challenge that I have is when to start taper and how many more big days I can squeeze in before it is too late. That is a discussion to have with Coach. Now back on the family. Naomi not only has 3 kids, she has also decided along with her husband to enter Shepparton 70.3 for later in the year. People think what I do is amazing and motivating, however going through the next 8 months with them is something that I truly cannot wait for. If I cannot draw some inspiration out of that, something will be wrong. We have already mapped out a game plan around the kids, work and training and the end result is going to be plain and simple. I have added 2 photos included mum & bubs. Things just keep getting better. 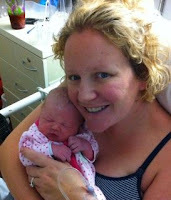 I even must say how good my sister looks in this photo as it was taken no more than 2hrs after the birth.